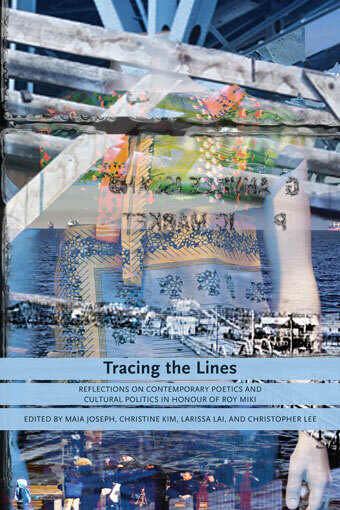 Edited by Maia Joseph, Christine Kim, Larissa Lai, and Christopher Lee. Contributors from across North America take Miki’s literary and artistic achievements as a starting point for analytical and creative reflections on key artistic, social, and political movements of the second half of the 20th century. Essays on poetics by Daphne Marlatt and George Bowering combine with original poems by Fred Wah and Michael Barnholden, among others, to explore topics ranging from voice, to love, to translation. Mona Oikawa, Dave Gaertner, Phinder Dulai, and Cindy Mochizuki write or create artwork on social justice, placing Miki’s redress work in relation to the politics and art of other historical reparations. Ashok Mathur, Ayaka Yoshimizu, Mark Nakada, David Fujino, and Hiromi Goto present various views of biotext. Jerry Zaslove, Susan Crean, Alessandra Capperdoni, and Smaro Kamboureli discuss the public intellectual’s relationship to institutions. The collection ends with an interview with Miki on interrelations between his photographic and poetic practices. Miki’s history reflects that of the West Coast’s literary world. Not only did he found the influential literary journal West Coast Line, but he has researched and written works on poets Roy Kiyooka, George Bowering, and bp Nichol. Miki taught many of the poets and academics now working and writing on the West Coast.